Whether a marketing campaign or a museum exhibit, a video game or a complex control system, the design we see is the culmination of many concepts and practices brought together from a variety of disciplines. Because no one can be an expert on everything, designers have always had to scramble to find the information and know-how required to make a design work - until now. 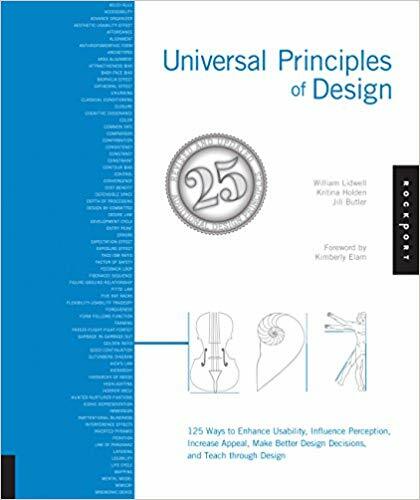 Universal Principles of Design is the first cross-disciplinary reference of design. Richly illustrated and easy to navigate, this book pairs clear explanations of the design concepts featured with visual examples of those concepts applied in practice. From the 80/20 rule to chunking, from baby-face bias to Ockham's razor, and from self-similarity to storytelling, 100 design concepts are defined and illustrated for readers to expand their knowledge.